It’s a rare treat to play a game like Octopath Traveler. Games that mimic the style of the 16-bit JRPG glory days are dime a dozen, but it’s not often a game achieves that classic feel while also being decidedly fresh and modern. That’s a tightrope that Octopath Traveler walks almost flawlessly, and the result is one of the best new RPGs in a long time. 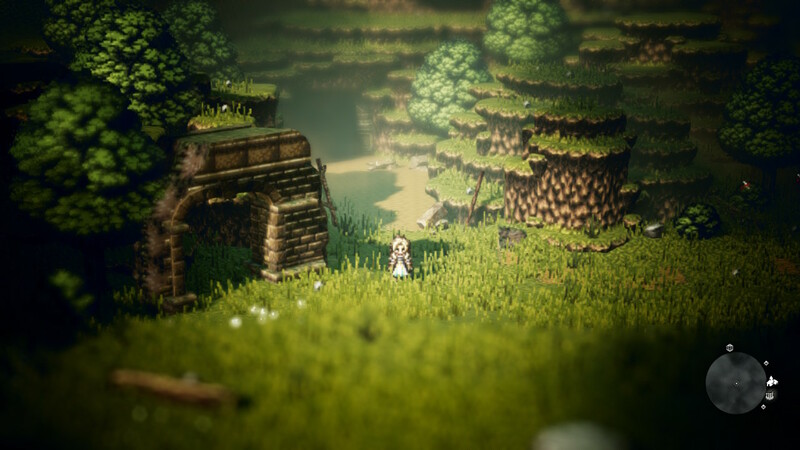 Related: Tokyo RPG Factory’s I Am Setsuna also took a modern approach to a classical style, though it did so in a very different way to Octopath Traveler. Read our review. That retro-modern attitude is immediately apparent in the game’s unique art style. The pixel art character sprites wouldn’t look at all out of place in Final Fantasy VI—indeed, that’s the comparison that a lot of people made when Octopath Traveler was first announced. The world shares a similar pixel aesthetic, and is similarly evocative of FF6 in its muted palette and detailed environments. Unlike FF6, however, Octopath Traveler‘s world is 3D. Instead of the flat, tiled landscapes typical of 16-bit RPGs, here we have maps made up of simple 3D shapes, the likes of which you might see in an early PS1 game, complete with the depth and perspective that comes with that. Those pixel-art textures are layered on top, along with lighting effects and a shifting camera focus, creating a stunning effect that blurs the line between 2D and 3D. The 3D models are simple—we’re not talking AAA photorealism here—but that’s all part of the effect. Octopath Traveler‘s whole world looks like something out of a popup book; like someone printed out maps from a SNES RPG and folded them into stunning papercraft dioramas. It’s instantly recognisable as a “retro” game, but that very retro-ness is remixed and reimagined in a way that makes the game feel fresh and modern. There’s a more practical application of that pop-up effect, too, as it feeds into the level design. Anyone who played those ’90s JRPGs will remember those treasures hidden behind fake walls that were indistinguishable from the real thing; the only way to find them was to stumble upon them, be told by someone else, or meticulously try to walk through every wall you find. 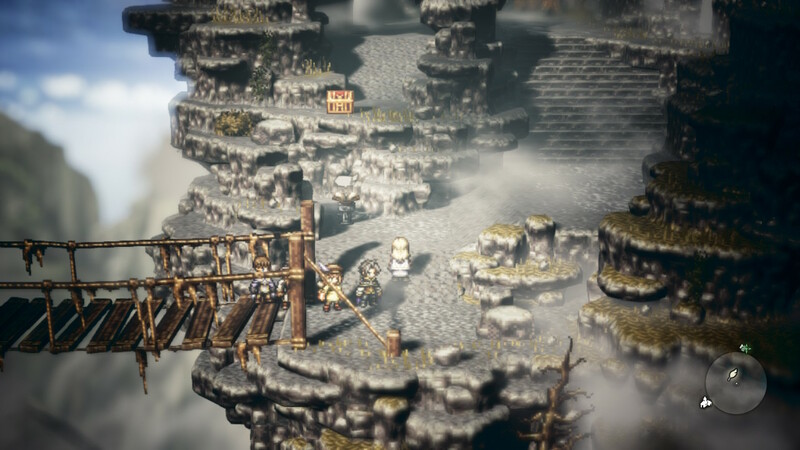 Octopath Traveler uses its fixed camera and diorama-esque design to emulate those sorts of “puzzles”, with secret pathways obscured by objects, walls, trees, and the like. Instead of being completely hidden save for dumb luck and prior knowledge, though, the 3D perspective drops little clues—there isn’t a treasure in the game that an observant adventure shouldn’t be able to find. It’s a callback to a more archaic trend, but reimagined in a way that fits a modern design sense. The visual design of the combat screen similarly blends the old and the new. Your party lines up on the right-hand side of the screen, ready to face off against a group of enemies on the right. The player character sprites are relatively simple to allow for the wide array of animations they need at their disposal, while foes are bigger and far more detailed. 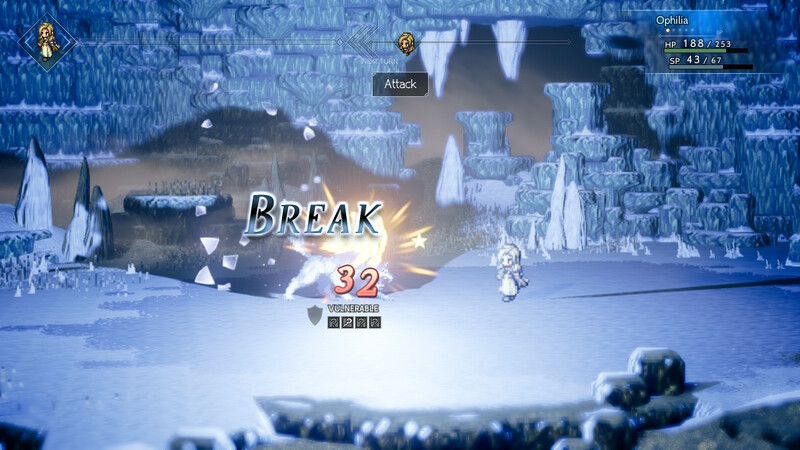 Octopath Traveler‘s enemies aren’t purely static images though; they have their own limited animations, and even when those aren’t in effect, the sprites heave and sway with a life that 16-bit RPG enemies never had. 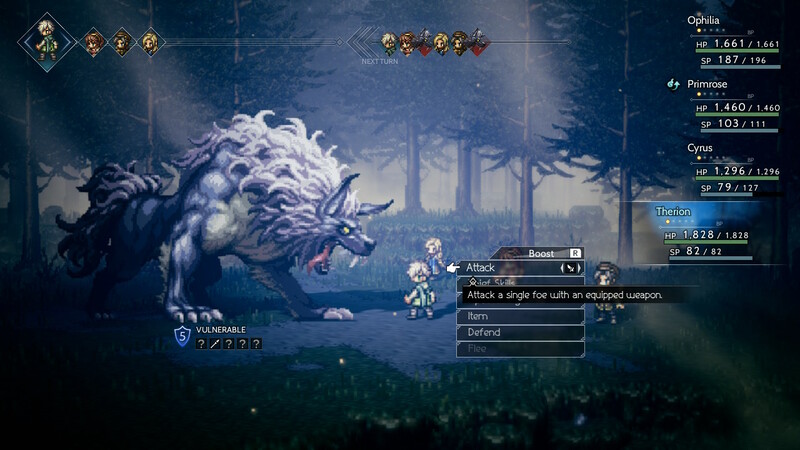 In combat, as in the rest of the game, Octopath Traveler, wears its nostalgia on its sleeve while also modernising a classic. The fighting itself is one of the most refreshing takes on the classic turn-based formula I’ve seen in a while. At its heart is the Break system: each enemy has a handful of different weaknesses to weapon types and elements, and each time you hit one of these, you reduce that enemy’s break gauge. When you get that gauge down to 0, the enemy becomes “broken” for the next couple of turns—meaning it can’t attack, and takes significantly increased damage. Running alongside this is the Boost system. At the start of each turn, each character in your party gains a Boost Point (or BP), up to a maximum of five; these can then be used to power up special attacks or increase the number of times a regular attack hits. At the simplest level, you’ve got two options for using BP: get as many regular hits in as you can, in order to break an enemy as quickly as possible, or slowly whittle away the foe’s break gauge and then pour all your BP into some supercharged attacks while they’re vulnerable. In practice, things get a lot more complex than that. As the situation changes, you’ll need to shift your priorities between quick breaks, big damage, bursts of healing, buffs, and dropping debilitating status ailments. Bosses in particular push the system to its limits, with a wide range of gimmicks from increase the size of their break gauge each time they’re broken to shifting weaknesses around. They tend to hit like trucks, so trying to bulldog your way through is a quick route to defeat, but smart use of your BP will let you defang their most powerful attacks and let you drop some big damage yourself. 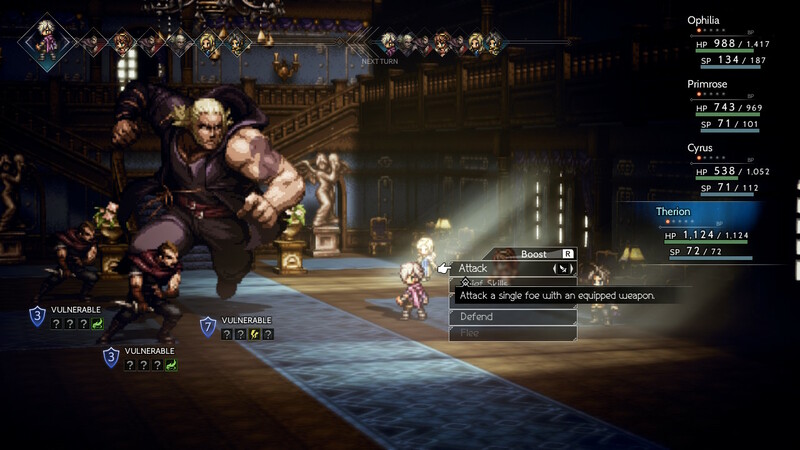 I tend to hate boss fights in JRPGs, but Octopath Traveler‘s combat is so layered and intrinsically satisfying that the boss fights are among my favourite parts of the game. That said, the boss fights do suffer from needlessly stretched out due to their massive health pools. It’s not unusual for an encounter to take upwards of half an hour, and at some point even the most tactically demanding fight turns into a rhythm of whittling away at the enemy’s HP. This is especially true of the later bosses, which are particularly bulky unless you’re severely over-levelled. That brings me to the one area where Octopath Traveler feels truly archaic: it demands a lot of grinding, even just to progress through the main story. The way the story is structured means you need to keep all eight main characters levelled up, but you can only have four in your party at a time and those waiting in the wings don’t get any experience points whatsoever. Even aside from that, there’s typically a big gap in the recommended level between one story quest and the next, necessitating a lot of extra grinding just to keep moving through the game. That sort of design wasn’t uncommon in the JRPGs of yesteryear, but the genre has thankfully moved on. Nowadays, you can expect that as long as you’re not fleeing from an inordinate number of fights, your party will naturally keep up with the demands of the main quest, with grinding only really being necessary for optional side quests. Grinding can be a lot of fun, especially with a job system like the one Octopath Traveler sports, but it needs to be something you can do on your own terms. In its storytelling, as in everything else, Octopath Traveler looks to reimagine the classics, though it’s perhaps less successful here. 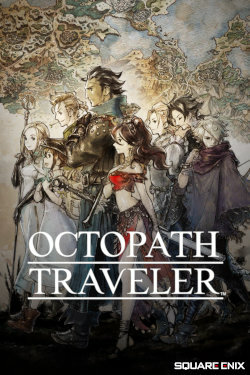 The game centres on eight main characters, each on their own journey and with their own stories to tell, but brought together by fate and circumstance. Each individual tale plays off those timeless JRPG tropes, from quests for revenge to religious pilgrimages, and individually, they’re compelling. Olberic’s journey to find meaning in life and a reason to fight after losing his home and the king he fought for is a timeless one; so too is Primrose’s lifelong quest to get revenge for the murder of her father. Alfyn the apothecary and Tessa the merchant each get their own coming-of-age story as they journey across the world to develop their respective trades. These stories may not be especially complex, but their timeless simplicity, coupled with some excellent dialogue and voice acting, makes them every bit as emotionally resonant as their inspirations. 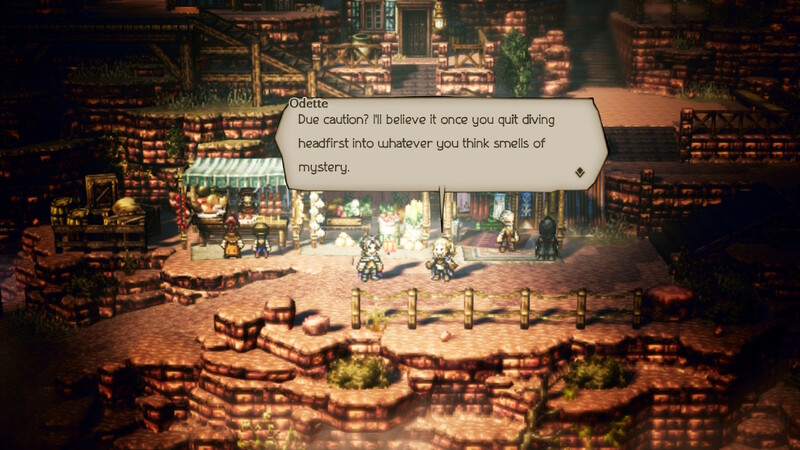 However, the way Octopath Traveler tries to blend these stories undermines a lot of their weight. Each character’s story is divided into four chapters, but the level requirements for each chapter mean that, unless you spend a lot of time grinding, you’ll end up doing all chapter ones, then all chapter twos, and so on. Needless to say, that really hinders the pacing. There’s also very little interaction between characters aside from the occasional optional exchange. That’s fine, for the most—in fact, I quite like the idea of a group of rogue drifters, travelling together but each with their own story to tell. They’re very personal tales, too, with their own supporting characters; if anything, I think something would be lost if the main characters were suddenly forced into one another’s stories. The problem is that it gets very jarring to go from having a full party as you explore, to everyone suddenly disappearing for a cutscene, and then back to a full party for a fight. That’s particularly true when you have scenes like a thief character breaking into a manor and sneaking around, or a fighter engaging in what’s supposed to be a one-on-one duel. 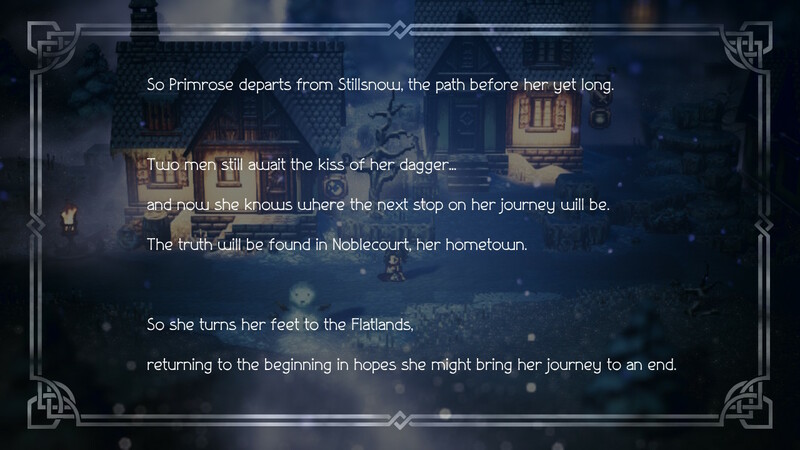 Again, I think it works to Octopath Traveler‘s favour that the stories are as individual as they are, but that doesn’t really line up with the party-based game design. Even so, Octopath Traveler is a game that has me hooked. Notwithstanding the pacing woes, the stories that the game weaves are enthralling, and the combat system is one of the most exciting I’ve seen in a long time. This is a game that wears its nostalgia on its sleeve, but instead of simply emulating what made those ’90s classics special, it looks to refresh those ideas. In that, Octopath Traveler is a remarkable achievement.